Social Factory is our Joomla solution for a modern and dynamic social networking website. It gives users all the common interaction functions and more. In this guide we will have a look at some of the features our component provides for the users. This is the regular display of the user menu which also contains some submenus that are not visible in the screenshot. (!) It is very important to know that, depending on your membership, you can be limited on some actions which are set by the administrator like the number of friends, photos and videos added, messages and interactions sent, events, joining or creating groups. Purchasing a Membership Plan can remove those restrictions ! 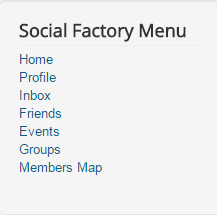 Before you start using Social Factory you will have to create a new account. 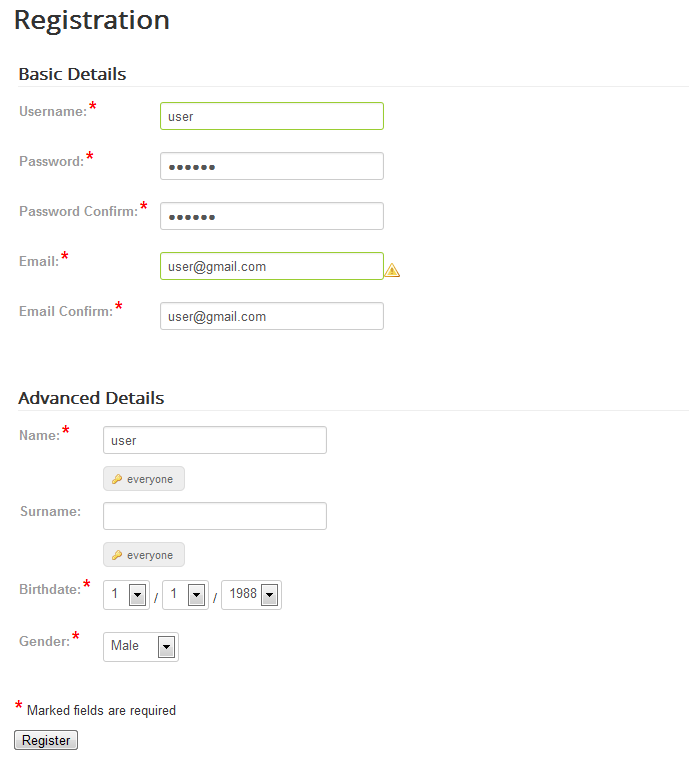 Click on "Create an account" on the login page or module, and add the required details. For this guide we will be using Social Factory's registration form. First things you will need to enter are the basic account details. Write the username, a valid email address and password. Below these are the advanced details - Social Factory profile specific, the marked fields are required. Here you can add your name, surname, gender (male, female, couple or other) and your birthday. In case of names and surnames fields, you can change their visibility for other users. You can either let them visible only for you, for friends only or for everyone. Click on Register when you are done. Your account must be approved before being able to login. This is either done by you via email or the admin, according to the Joomla configuration. By clicking on "Profile" you can view your details. Each user can also comment on their own profile or other people's profiles. Since we just created this user, there are no details on the profile page. The Profile page has 3 submenus. Click on Edit to modify your details. 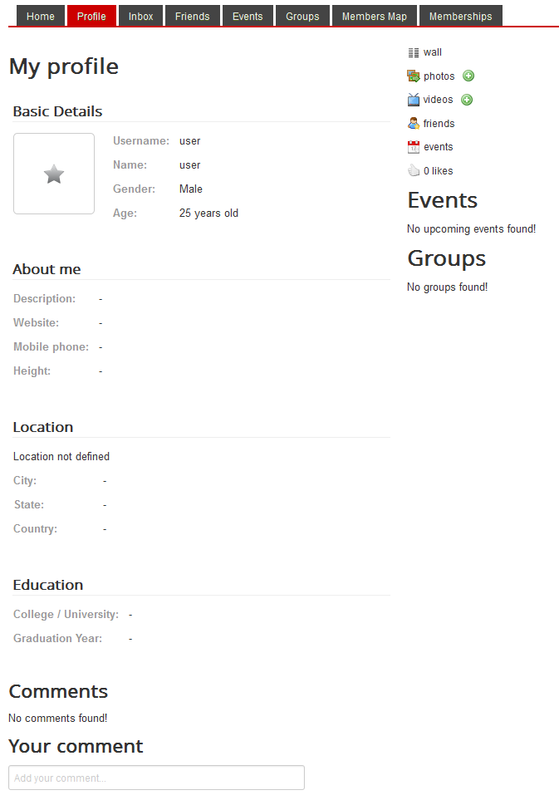 Here you can add more information on the profile page such as location, height or a description. It is important to note that list of fields can be altered with custom fields. Clicking on the key button will allow the user to set the respective field visibility to either himself only, for his friends or for everyone. 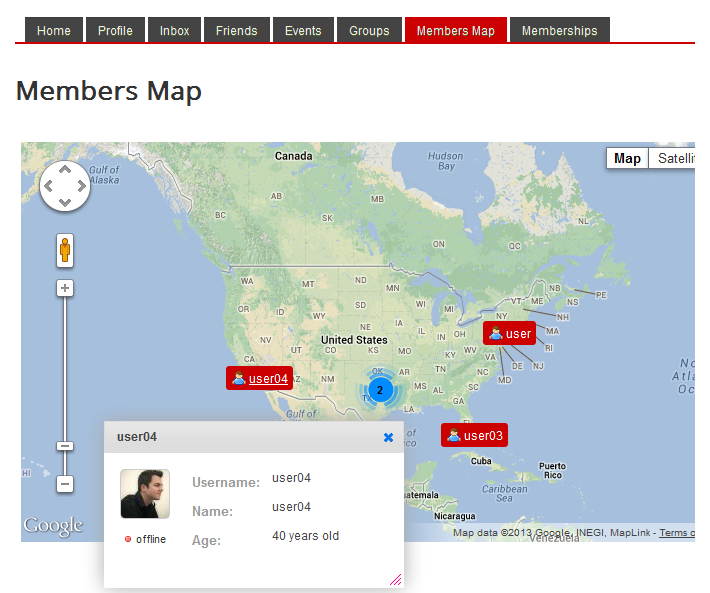 Education area allows you to add your college/university or the graduation year, as details on your profile. The same as you can hide some details, you can also hide your status from other users by setting the Profile Privacy. You can set it to either public, just for friends or offline. From this area you can also delete your profile. After clicking on Delete profile you will be redirected to a page where you need to confirm . Be sure what you choose since this action cannot be undone. Click on Apply Changes or Save Profile when you are done. 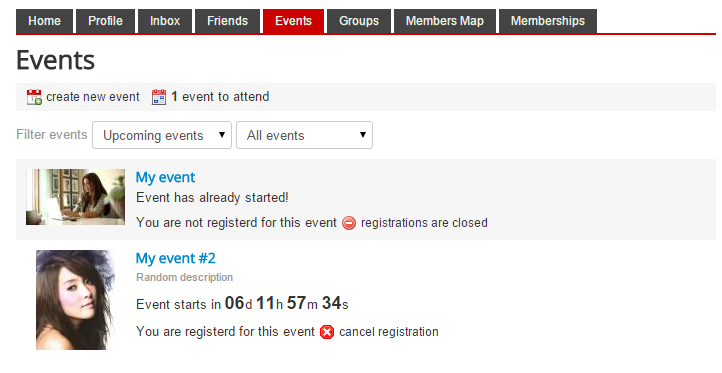 This is how your profile will look like after the changes: on the right side you can view the events and groups joined. Now click on Wall to view your personal wall page section. On this page you can share various messages with your friends. The messages will appear on your friends home pages and they will be able to reply or like them. The Photos submenu allows you to create albums and upload photos. Click on New Album and add a title and a description for your new album, then click on Save. Now that you have an album you can upload photos and select an album cover for it or a profile photo. To upload a photo, click on the button and select the photo from your system. Then you can add a description or set the selected photo as the album cover. Click on Confirm photos to finish. Once you uploaded the photo, other users will be able to like, comment or report it. Check the tickbox on the right top corner of the photo and click on Profile Photo to add it as your profile photo. Videos page allows you to check your video gallery. To proceed adding a new video click on add new and include your embed code. To add a YouTube video, simply copy/paste the URL and click on Retrieve YouTube data, this will fill automatically all the required fields. Make adjustments if needed to the other fields and click on Save video to finish. 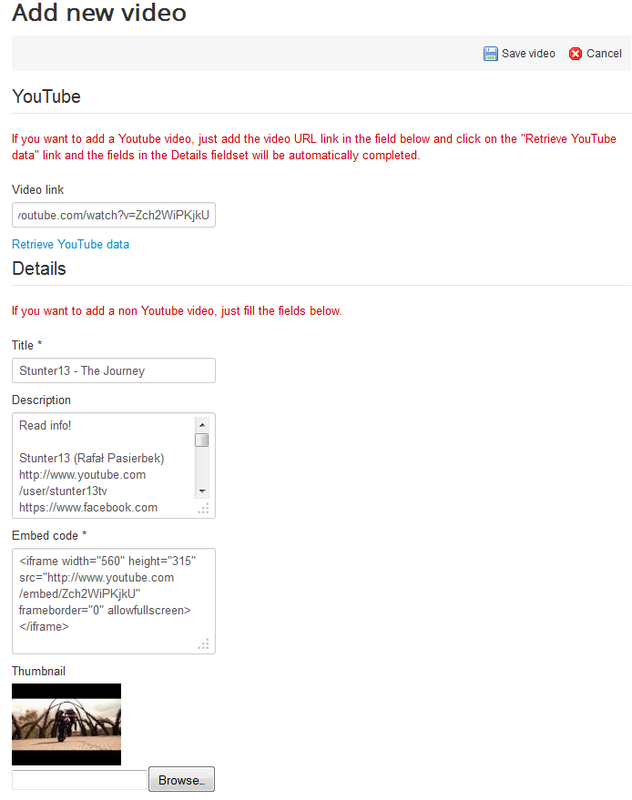 Other members can like or report your videos, if the case. To delete it, simply select it and click on Delete. 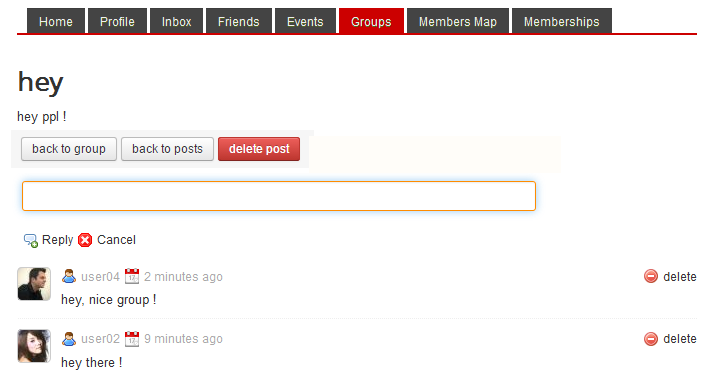 In the Inbox area you can view and manage all your private messages. To see the received message click on its title. Here you can reply to the user who sent the message or, in case he was rude or abusive, you can ignore or even report him. To reply, click on Compose reply and write the message you wish to send. Click on Send message when you are done. 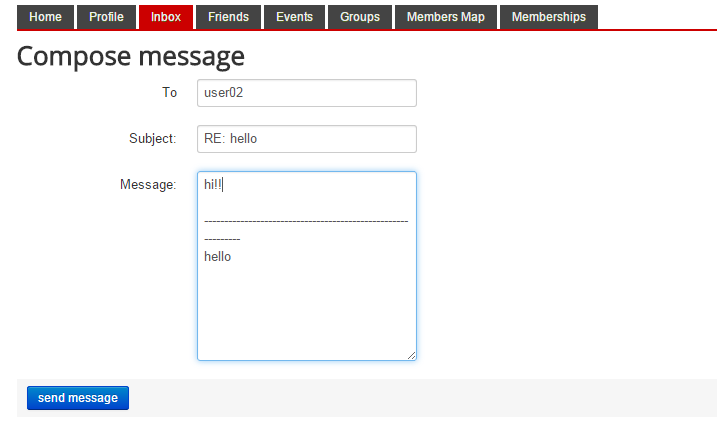 On the Outbox area you can view the messages sent by you and delete them, if necessary. 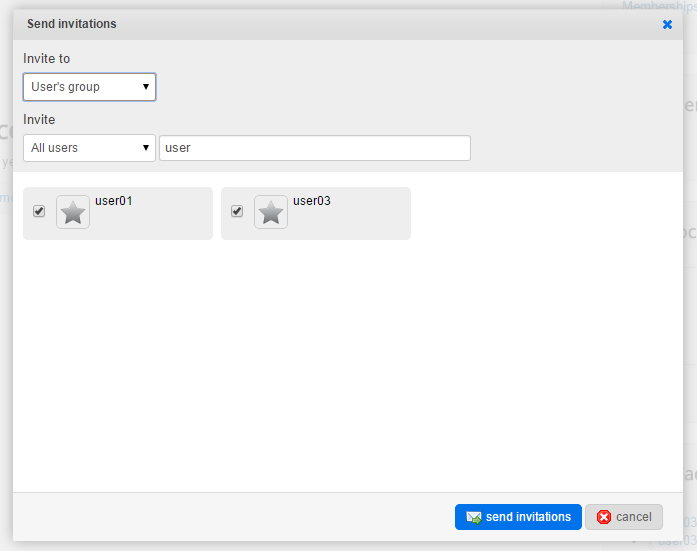 From the Invitations submenu you can accept or decline events and group invitations send by other users. By clicking on the title of an event you can see all the information related to it. Here you can see the exact time left until the even starts and when it will finish. You can check the location and who are the attendees and also comment or like the event. Clicking on Register will add you to the attendees list. Below all these you will find an activity history that displays all the comments and who joined or left the event. Interactions allows you to check all the interactions sent to you with the ability to respond back. The "smile" interaction is added by default, but many more can be added by the administrator, if desired. 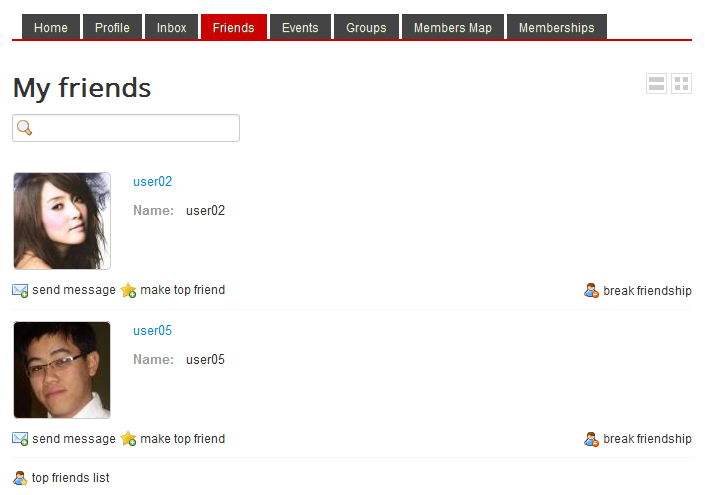 On the Friends tab you can view a list of all your friends, send messages or choose which to set as top friends. In case you have many friends, you can use the search box to find a specific one easier. To remove them from the list click on break friendship. You can add friends to a top friends list, which allows you to have an easier access to their profiles. From this submenu you can send them messages or remove them from the top friends list. You can search for new friends using the Search submenu. Here you will find all the registered users that don't have their profile hidden. You have the options to search by gender, age and if you wish to display only the online users. Additional custom fields can be added on the search form, if needed. From this submenu you accept or decline friendship requests. Clicking on the user who made the request allows you to check his profile. If you have something to say to him you can send him a message. You can ignore abusive or rude users by accessing their profile pages and clicking on Ignore User. From the Ignore List you can check them out and remove them from the list. On the Events tab you can view a list of all the events, giving you the option to display only the upcoming ones or the passed events by choice. Click on Create New Event to add a new one. Now add the details regarding the event. Add a title first, preferably mentioning the type of event. Add the date and time for the start and end of the event. Add the date and time for the start and end (deadline) of the registration process. 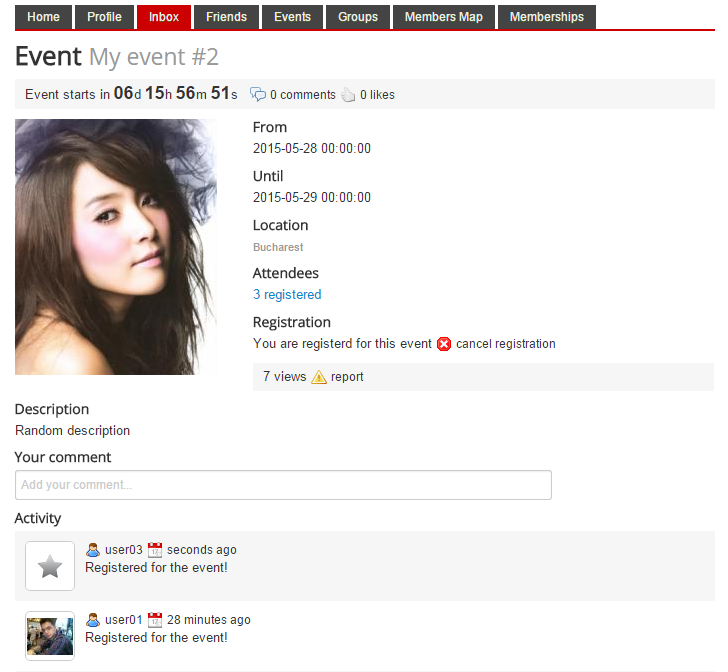 If wanted, you can allow others, besides you, to invite more users to the event with the Members invitations option. On the Publishing area you can choose to make it visible (publish it) immediately or from and until a specific date. Image & Description allows you to add a logo for the event and a description, where you can add more explicit details about it. Below all of these these you can add details about the Location. To make the location even easier to find, you can add it using Google Maps. Simply zoom in and pinpoint where the event will happen. Click on Save to create the event. This submenu will help you search for events using Google Maps. 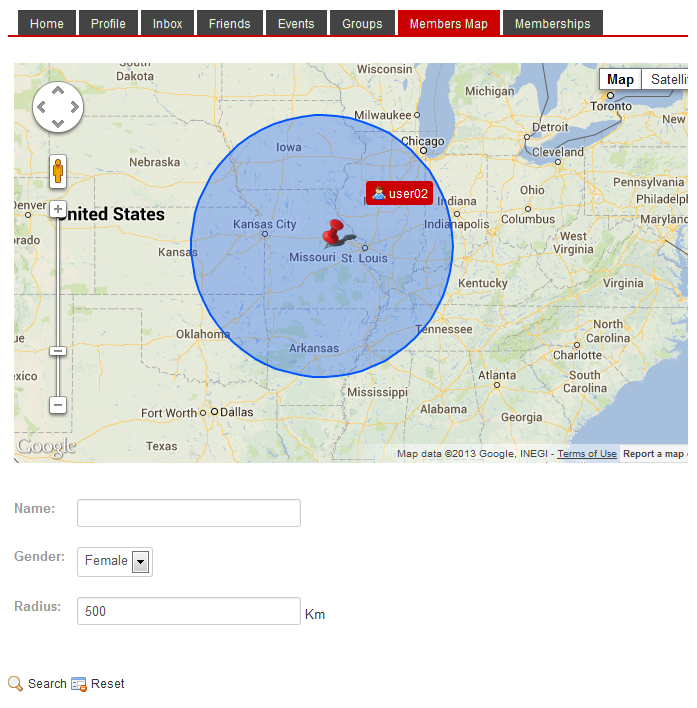 Pinpoint on the map what zone you wish to search and add a radius in km/miles to define a specific range. 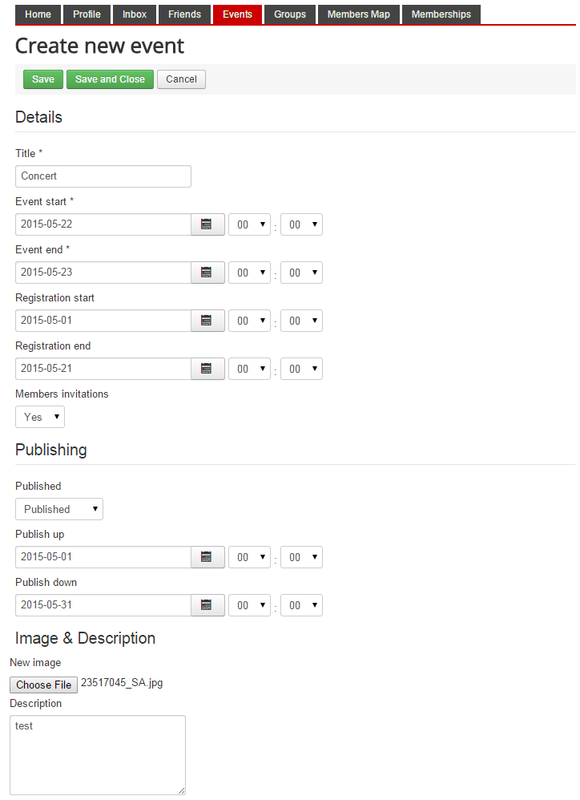 Once you clicked on Search for events, the available events on that range will be displayed. Click on them to see more details of the respective events. 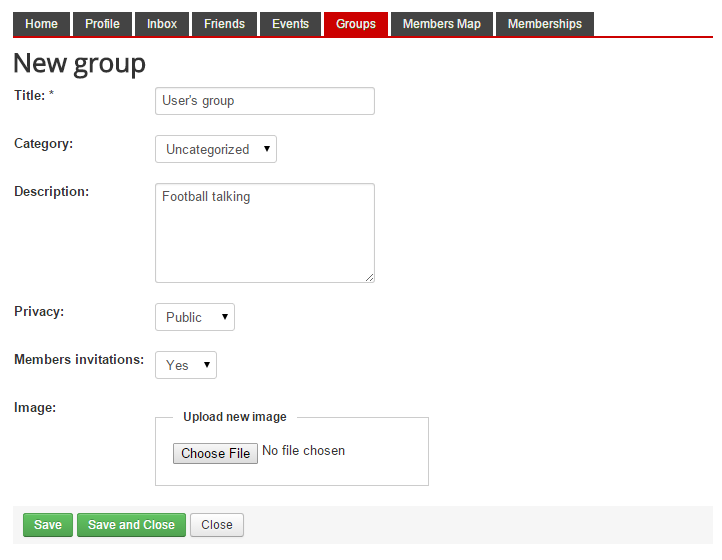 On the Groups tab you can view a list of all the groups and the option to create new ones. A search and filtering system is available which allows you to search certain groups with ease. 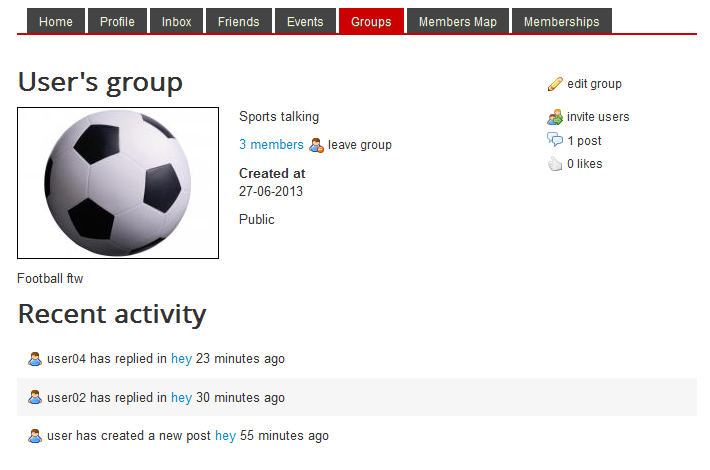 Click on Create new group to make a new group. 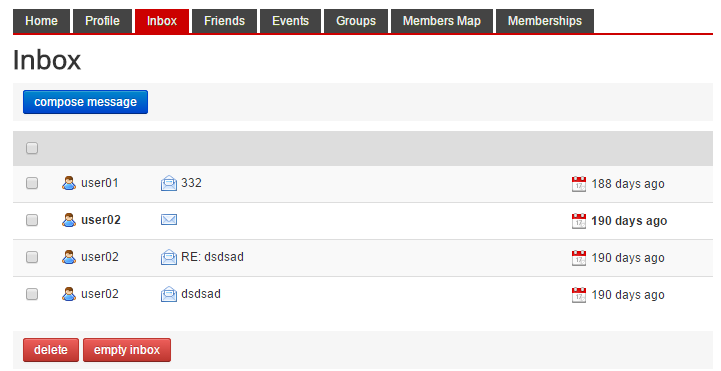 When adding a new group you can set some details related to it. Add a Title and a Description so other users will know what this group is about. You can select a category. 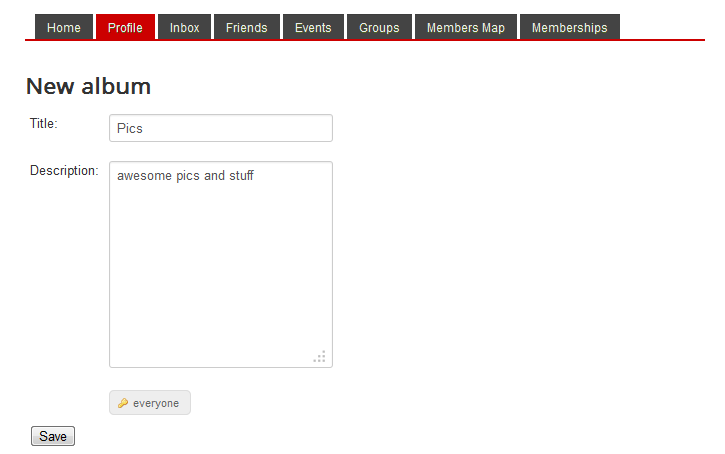 The group categories are added by the administrator in the backend, so the list will vary here. You can set the Privacy for your group, Public or Private. By setting it as private, other users won't be able to see it or join it unless they get invited by the owner. In case you want your group to attract more people and look better, upload an Image. Click on Save and Close to create your new group. By going to your group's main page you can change the settings with the same form you created it clicking on edit group. Additional option is to delete the group. Clicking on invite users will pop up a window where you send invitations to multiple users to either this group or other groups/events. Every group has a room where users can post messages. By going to a post you can reply or view other user's replies. On the main page of the group you will also find a like button, which also displays how many likes were given and a recent activity displaying a short history of the recent posts and comments. 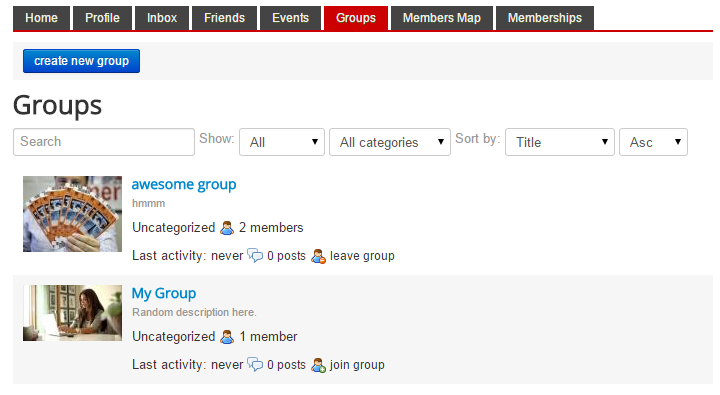 To remove a user from the group click on the members count and then on remove member. In case you don't wish to be a member of this group anymore and you are not the owner of it, click on Leave Group. From this tab you can see the location of all registered users who added their location using Google Maps. The place displayed with a number on the map means that there are more users in a close proximity so they have to be grouped to avoid overlapping - Zoom in to see them all. 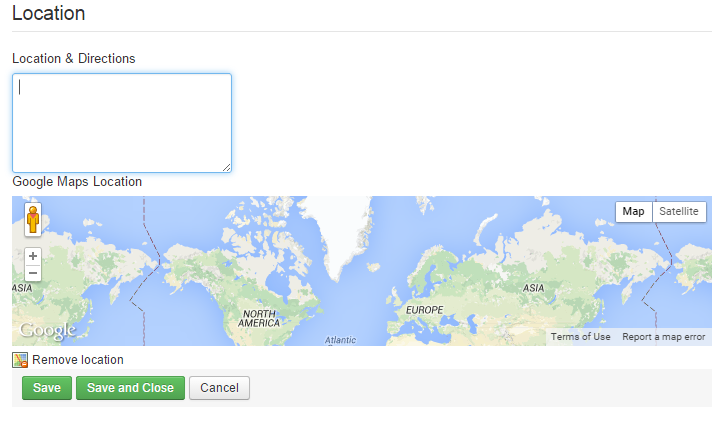 In the Radius Search submenu you can search users by their location using Google Maps. You can add as a criteria of search the gender or name of the users. 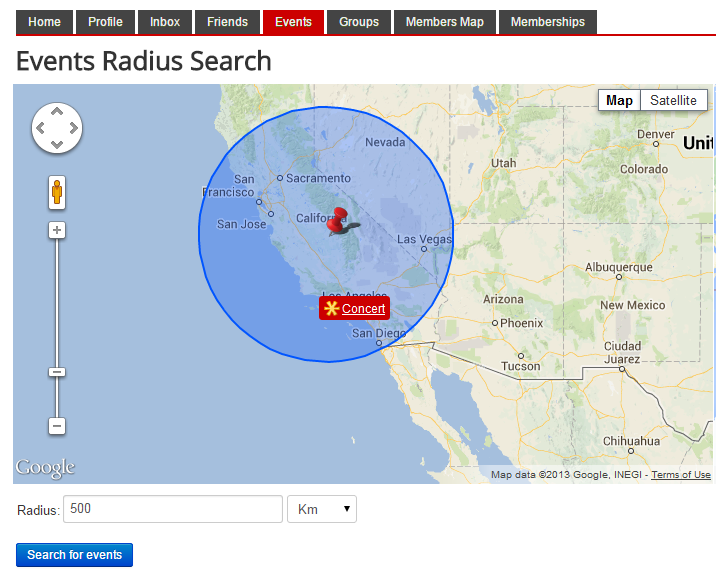 Add a radius in km and click on search to see the results. The Infobar is a great feature that helps users navigate even easier around the website providing shortcuts to some areas and notifications when receiving new messages, interactions or requests and also the logout button. The bar will have to be enabled by the administrator from the backend and, if so, it will be visible on every page you visit. Layout and fields will vary a lot depending on each configuration. This documentation is based on the default installation. To see how you can configure your Social Factory Component, see the Social Factory » How to Add a Field Setup and Custom Fields guide.